All I Really Need to Know (About Creative Thinking) I Learned (By Studying How Children Learn) in Kindergarten. 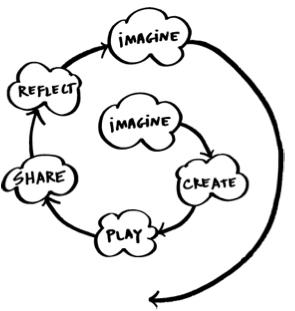 Somewhat similar to to Imagine-Create-Play-Share-Reflect. The visualization as a spiral is better than my closed circle. I typically explore an area before I create something. In my personal experience I have not done much sharing of my experimental stuff. I'm hoping to use this course as an opportunity to make a change and share more.